Although most cameras offer internal memory, most don't have enough to make their use worthwhile — so most photographers rely on memory cards to store their photos. There are at least six different memory card types that have been used in digital cameras in the past. 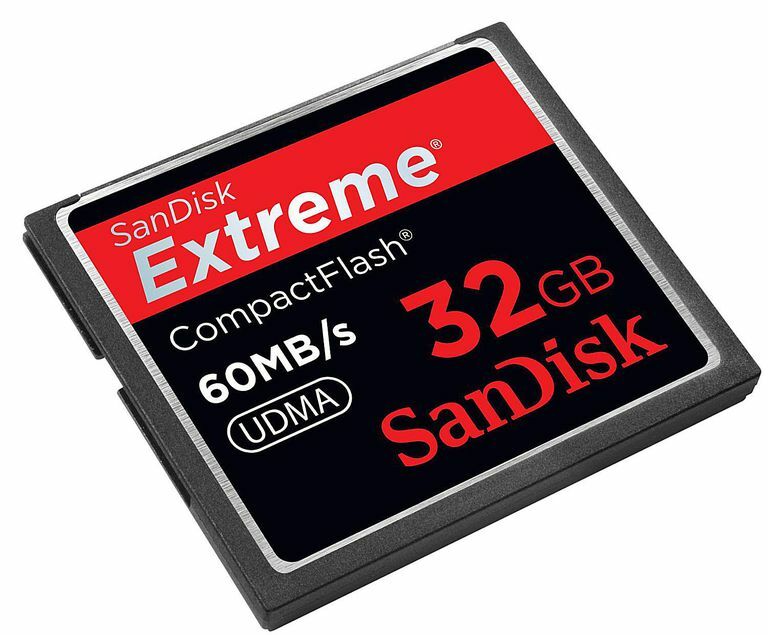 Most new cameras use SD memory cards, but CF (CompactFlash) memory cards remain in use today, particularly in high-end cameras. They're typically a little larger than a postage stamp and can store thousands of photos. The CF standard was initially developed in 1995, and it was aimed at the professional imaging product market, rather than at consumer-level cameras. The latest CF specification is version 6.0, and these CF cards can support transfer speeds up to 167MB per second. If you'd like to learn more about the CompactFlash standard, visit the CompactFlash Association website, where the standards are unveiled and news is announced. Card recognition problems. Your camera can have issues recognizing high-capacity CF memory cards (usually at least 16 GB) or reading its full memory space. If this occurs, your camera may need a firmware update or upgrade. Check your camera manufacturer’s website to see whether any are available. Slow, glitchy performance. If your CF card’s downloads seem to run more slowly and less smoothly than you expect, it’s possible that the card does not have UDMA (Ultra Direct Memory Access) protocol support. Older CF cards use PIO (programmed input/output) protocols, which transfer data more slowly than UDMA. Because the CF cards that support UDMA are more expensive than the PIO CF cards, you might have some of both types of cards in use. The fix is to upgrade to a UDMA card. Malfunction with a potential loss of photos. First, try to read the CF card in another device, just to make sure the problem is with the card and not the original device. If the CF memory card still won’t work, you might need a data recovery service. You can find such services at camera repair and computer repair stores, or you can download data recovery software. Check with your CF card’s manufacturer for specific recovery software recommendations. Failure to read data. When formatting your CF memory card using your computer, make sure you use a file system that will work with your camera. Some older cameras cannot read CF cards that are formatted as FAT32 (File Allocation Table) or NTFS (New Technology File System). If this is the case, format the CF card with the FAT file system. Likewise, some cameras cannot read CF cards formatted by other devices, no matter which file system you select. Try formatting the CF card using the camera itself. It's pretty easy: Just check your camera's owner's manual or scroll through the camera's settings menu to find a format command. Select this command, and then click Yes when you're asked whether you want to format the memory card. This process will erase all of the data previously stored on the card.